This project we molded the UN and were assigned a country. After we where assigned our country we then had to research the issue from our countries perspective. After we had done all of the research and things that were needed to be done, we did a simulation model UN. If I was to tell another student about this project I would say that you really need to use all of the time that was given to you and use it wisely. It may feel like you have a lot of time but it really isn't as much time as you think it flies by. I know this because I kept thinking that we have a while tell our exhibition then it just came up and I was surprised. I think that the habit of heart and mind that I used most is advocacy, especially during the un-moderated caucusing I really showed my perspective in talking to the other students and persuading them to come to my side. I think that I did a good job because I got two countries to go to the two state solution and vote for it at the exhibition. The greatest challenge for me was talking in front of everyone. I never have been a great public speaker. I have been trying to get better at public speaking but it is just hard for me to talk in front of a bunch of people. I think that one of the resolutions that will stick in my mind is (3a) written by The Russian Federation. This one will stick in my mind because Russia put in there that they should get all sanctions removed if they were to help with this issue, I think that that is funny because they had their solution to the issue but they wanted all sanctions removed off of them in exchange for their help. I think that this is funny because everyone wanted to help but Russia wanted all sanctions removed. In this project, we studied Greek tragedies and the format of which they are written. We learned about some social issue in our society today. Then, we wrote wrote a modern tragedy based on the social issue we chose. My partner and I chose to do Human trafficking as our social issue. Our tragedy was about a younger brother who got kidnapped when they where in Africa travailing. Four years later the older brother became a news reporter and went back to Africa to try to do a report on human trafficking. And tries to act as a buyer to buy some children to get the evidence that they need to arrest a lot of people who work in human trafficking business. But see's his brother and chokes and they both get killed. (A man comes on over the speaker.) We will be landing, shortly so please fasten your seat belts. Man’s voice: Jonathan are you there yet. Jonathan: Ya, the flight just landed. Man’s voice: You'll meet up with the local then? Jonathan: Yeah, where will he be? Man’s voice: He will be at the bus stop at 3 meet him there. Jonathan: Alright I will met him. Jonathan: Yes, You must be the local then. Chilongola: So my informant told me that you were looking for some workers. Jonathan: Yes I am, when will I get to see them? Chilongola: As soon as we receive the payment. Jonathan: (Being very stubborn) I would like to see what I am buying before I purchase them! Chilongola: (A little hesitant, let out a huff) Alright we can arrange a meeting as soon as possible. Jonathan: Alright just tell me when and where to meet. what children you would like to purchase. Chilongola: It was a pleasure doing business with you. Journal entry one: Today I flew out here to meet with a local human trafficker named Chilongola. The meeting went well with him and we are meeting tomorrow again but this time I am going to go buy some children from him so then we have the evidence that we need to stop this guy, and put him behind bars. This should also help by putting it out there into the world that there is still slavery in this world. Chilongola: Glad to see you made it. Jonathan: (Gulping before he spoke) so these are the children. Chilongola: Yes, how many do you want? Jonathan: I would like three of them. Chilongola:They all work very hard, If you use the right tools (leaning over and whispering in his ear) if you know what I mean. Chilongola: Who would you like to purchase? Jonathan: (Choking because his brother was there said.) Yes I would like to purchase those three right there? Chilongola: They were already purchased we are just waiting for them to get transported. Jonathan: I will pay you double what they are paying. Chilongola: No I already told you that they are no longer for sale they have been purchased. Jonathan: ( Being very confused said) May I have a moment alone to think about this. Chilongola: Yes but one guard will stay. Chilongola: (Speaking in their native language said to every one to leave, but pointed to one guard and told him to stay and keep a watch out. Jonathan:( Wandering around the little hut started moving slowly over towards the guard then quickly balled up fist swinging it at his head and knocked him unconscious. Jonathan:( Looking over to the children said) Hurry come with me! Guard: Suddenly a guard jumped out yelling in his native tongue swinging a bike chain and started beating Jonathan and Arthur down to the ground with it. He hit arthur once and he was on the ground but Jonathan stood back up and started attacking the guard. Guard 2: Jump out and lashes Jonathan over the neck with piece of razor wire, blood squirting everywhere Jonathan picks up a rock and knocks the guard over the head Jonathan and his younger brother run into the woods. Jonathan: Falls and his brother comes to check on him while he's laying on the ground Arthur gets shot in the head and falls dead next to his dying brother who watches him die. I think that I am most proud of my idea of photo shopping all of our pictures into Africa, because there wasn't places around here that look like Africa. We spent a lot of time working on our project photo shopping the pictures into different places. I worked on this project almost every night after school to make it better and better. I think that my favorite picture is inside the hut because I had to photo shop all of us into the hut and the AK-47 into Zach’s hands. I also probably spent the most time on that picture so I could make it look more realistic. I would tell the students that you really should use all of your time for working on the projects because it isn't as much time as you would think it is. I had to keep refining my essay for the first two and a half days because my partner was gone and that really set us back. So we had to work on it a lot after school was over. I think one other thing is make sure that you take multiple pictures of every scene so you don’t have to go back and take more pictures and re-set up the scene after you did it once already. I think that you really need to choose a partner who will hold up there side of the project otherwise they will just hold you down. I think that it worked ok it could have gone a lot smoother but we made it work. I think it was very challenging because my partner didn't work on the project as much as he should have. I wrote and put together most of the play by myself he did help with some things but he could have managed his time better. I also think that my partner really set me back because he was gone for two and a half days and really set us back. I feel like the biggest challenge for me was working on my project towards the end because we had lot to do in a little amount of time. I overcame this by staying up a couple nights really late and working on it to get it done to the best of my abilities, and the teacher’s standards. In this project, we learned about the cycle of socialization; the process of which we go through as humans. We did this project for eight weeks watching videos, reading articals, so we could better understand this subject. We then wrote our essays on how we have been socialized to be and how it has changed us. Next we took We then took one day were we plastered are faces to get our masks. Then we spent the next couple of days working on designing our mask to show how we haven been influenced by society around us. we focused on three ways that society has changed us. Do you ever think how you have been socialized? The definition of socialization from Wikipedia says “Socialization is the lifelong process of inheriting and disseminating norms, customs and ideologies, providing an individual with the skills and habits necessary for participating within his or her own society.” One way that you have been socialized is the media. I think that it is a big player in our life, we are around it every day. I think that they are a huge player in the shaping of our lives. We see something on a magazine that we think we want to look like, but the truth is nobody looks like that. Everything that we see on a magazine is photo shopped, and it’s all fake. I have been socialized as a white male, growing up in the upper middle class. This has both been positive and negative in my life. I have grown up not really thinking about racism or being taught not to show my emotions or trying to fit in with the cool people or getting judged. We all in society today were a mask to try to fit in with the people around us because we are afraid of being judged or cast away. I have been socialized to never really think about race. Not to really bring up the matter so I don’t cause any issues with anyone. I think that we all don’t really want to bring up racism because we as white people don’t have to deal with it, as much as if you were an African-American. One example of this is “A Girl Like Me” they talked about how our society today thinks white people are better. In “A Girl Like Me” they did a study on twenty-one little African-American children. They put one white doll and one black doll in front of them and they asked the children what one they liked better, fifteen out of twenty- one chose the white doll because it was white. I believe that this is because we as white people don’t really intermingle anymore, like you don’t really see very many white people with African-American people. I think that we need to stop with racism. I personally don’t have to deal with a lot of racism, because I have grown up in a culture where there isn’t a lot of judgment with race. We don’t have to deal with racism in Durango as much as some other cities. Ever since I was a little kid I was taught not to cry or really show my emotions. Because I was supposed to grow up to be a strong man who never cried never showed emotions. I think that this is turning us into like a robot not to show emotions to anyone and especially women. In the video “A Call To Men” Tony Porter said, “He didn’t want to cry in front of me, but he knew he wouldn’t make it home, and it was better to cry in front of me than allow himself to express these emotions in front of the women.” Men are taught not to show emotions especially around women, because we are supposed to be strong we aren’t supposed to have emotions because we need to be the strong ones in our families. This is true in my life because I have grown up on a farm. I have always been taught that we as men can’t cry because we need to be strong. I have grown up getting told that if I cry it makes me weak. As a little kid I didn’t want to be weak, so I tried my hardest not to cry ever. In the movie “Mean Girls” by Tina Fey and directed by Mark Waters. Damian says “don’t join the math club, its social suicide”. I think that in this movie it really talks about how we want to be one way but we end up not doing something because we are afraid of being judged or not fitting in with the other people around us. We all need to be who we want to, not who the people around us want us to be. We need to stand up for what we believe in. We all give up something in our life that we wanted to be or who we were because we were afraid of getting judged or getting rejected. I think that this is true in my life because I have been told by everyone around me that being a nerd isn’t cool and I work too hard on my school. I believe that this wouldn’t be as much of a problem if we didn’t judge people for who they are, regardless of race, economic class, gender, and sexual orientation. This would make life so simple if we all could accept someone for who they are. We need to start teaching our children that it is ok to be different than everyone around us, that we all are different in our own ways. We all need to stop judging because of the pigment in our skin, or economic class, or our sexual orientation. I think that we need to treat everyone the same. We don’t really change because we are afraid to changing into something new. We all are afraid of trying something new then failing at it. 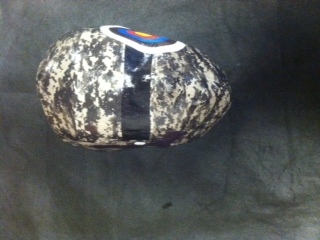 For my mask I would like to have a camo background to show how we try to blend into society today. I am going to leave an area black over the eyes to show how society blinds us from racism. I am going to have duct tape over the mouth of my mask to show how we have been socialized to not talk about racism, or gender. My mask is trying to show how the agents never really want to address the matter because it is for their benefit. Targets don’t really want to address it ether because they are afraid that the agents are going to get back at them, for trying to take away their power. I think that I am most proud of my idea in making my mask background camo, I think this shows how we try blend into society around us. We all try to blend in to society around us, so we can try to fit in with the people around us. We all want to be as normal as we possibly can be, without really standing out, especially in a negative way. This is so we aren’t considered as an outcast or different, we don’t want to be rejected for who we are. I think that for most people, we want to be normal, so we fit in. Do you ever think how you have been socialized? The definition of socialization from Wikipedia says “Socialization is the lifelong process of inheriting and disseminating norms, customs and ideologies, providing an individual with the skills and habits necessary for participating within his or her own society.” One way that we have been socialized is the media. I think that it is a big player in our life, we are around it every day. I think that the media is a huge player in the shaping of our lives. We see someone on a magazine, or TV that we think that our goal is that we want to, or should, look like them. The truth is no one really looks like that. Everything that we see on these magazines and billboards are photo shopped, and it’s all fake. I have been socialized as a white male, growing up in the upper middle class. This has both been positive and negative in my life. I have grown up not really thinking about racism or being taught not to show my emotions or trying to fit in with the cool people or getting judged. We all in society today wear a mask, a mask to try to fit in with the people around us because we are afraid of being judged or cast away. I think that I will take away a lot from this project. I think the biggest thing that I will take away from this project is how much racism there is in the world around us without us knowing. It is all around us without us realizing it. Especially as being raised as a white male we have privileges that we don’t really see. It is kind of sad seeing this happening all around us, and nobody is really realizing it. In our next project I think that I will try to ask more questions, and get more advice from Sara, and the people around me. I don’t think I did either of those very well in our last project. I really would like to start pushing myself to do my best work that I can do. This should help me with getting better grades in my class, and getting a new perspective on things. To get a wider view of things around us.